A thermocouple is basically a device for measuring temperature. Unlike a thermometer, which relies on the thermal characteristics of a material like mercury, a thermocouple measures temperature by generating an electrical voltage. That makes it useful for signaling electronic systems that control household gas devices, such as water heaters and boilers. Various types of thermocouples are available, but your furnace thermocouple or the one on your gas water heater is most likely a k type thermocouple. Its purpose is to keep the pilot lit. In the 1820s, German-Estonian physicist Thomas Johann Seebeck discovered that two dissimilar metals joined at a junction point generate a small but measurable voltage when the temperature at the junction point changes. The magnitude of the voltage depends on the magnitude of the temperature change and on the characteristics of the metals. 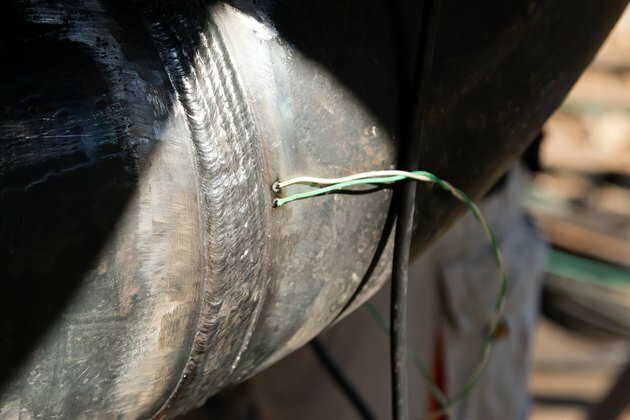 A thermocouple may consist of a pair of insulated wires, each made of different metals, joined together on one end and connected to a measuring device at the other. It may also consist of coaxial sheathings separated from each other by insulating material. The function of a thermocouple on a gas appliance, such as a water heater, is to signal the gas valve that the pilot is lit so it will remain open. It's a safety device. If the thermocouple weren't there, gas would continue to flow when the pilot goes out. The unburnt gas would accumulate and eventually, it could explode. The thermocouple probe, which is the junction of the two metals from which it is made, is positioned in the pilot flame. It detects the heat of the flame and generates the voltage that keeps the gas flowing. If the flame goes out for some reason – for example, because of a breeze or partially restricted gas tube – the thermocouple voltage disappears and the gas valve closes. Thermocouples are useful in a wide variety of industries, and each of the many types is designated by a letter. For example, a type S thermocouple has wires made of pure platinum and an alloy of platinum and 10 percent rhodium. It is accurate at very high temperatures and is used most often in the BioTech and pharmaceutical industries. Typically, you find a k-type thermocouple in household gas appliances. Its positive leg is an alloy of nickel and chromium and its negative leg is an alloy of nickel, aluminum, manganese and silicon.